Railway Use: 1914 essay 1d. Rarity Scale: 1914 essay 1d R4. Background: This essay was prepared for use but rejected. 333 was the station number for Isis Junction and would correspond with the station numeral. It seems that the concept of a station number perfin was rejected in lieu of a printed number as when these stamps were issued they carried the station number in red in the lower cartouche prior to issue. Device: Queensland Government Printer rejected essay. Numeral issue 2d, 4d, 1/-, 2/-, 3/- 5/-, 10/-, 20/-. KGV 1926 issue 3d R4. Numeral issue 2d, R2, 4d R4, 1/- R1, 2/- R4, 3/- R4, 5/- R3, 10/- R4, 20/- R4. Device: Cancelling device from Brisbane only. Two ring oval embossed with A.M.P. at top and INS. SOC. 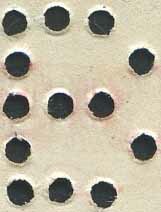 at bottom separated by stops left & right with centre HORIZONTAL star shaped punch hole further tying the stamp to a document. 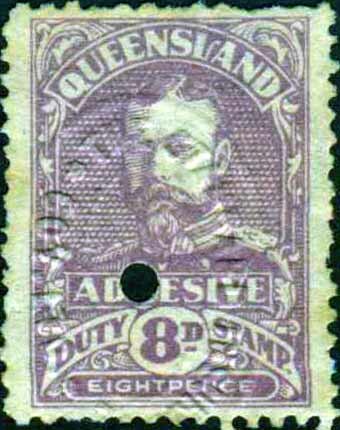 Revenue Use: KGV 1926 issue 5/-. Rarity Scale: KGV 1926 issue 5/- R4. Device: Cancelling device from Brisbane only. 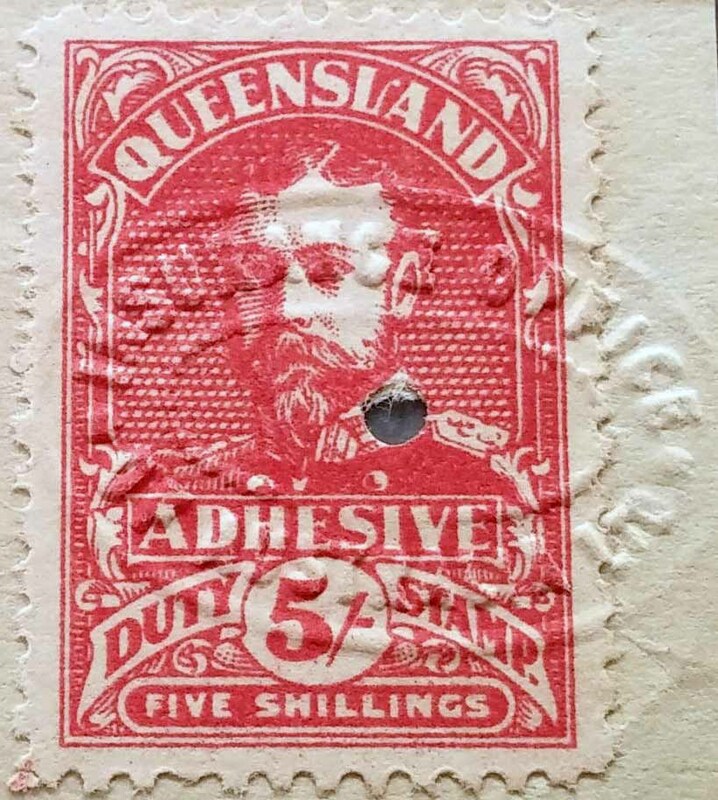 Two ring oval embossed with INSURANCE OFFICE at top and OF AUSTRALIA LTD. at bottom separated by stops left & right just below the centre, circular punch hole further tying the stamp to a document. Revenue Use: KGV 1926 issue 10/-, 20/-. Rarity Scale: KGV 1926 issue 10/- R4, 20/- R4. The company grew quickly reflecting the booming Colonial economies of the time and they established offices initially in Sydney but later in Melbourne, Brisbane and Adelaide all in the first year of operation. In addition they sought and received many offers to provide agencies from Regional centres throughout New South Wales, Queensland and Victoria. The head office of the company was located in a series of offices in Pitt Street, Sydney, initially 177, then 168, 158 and 131, before the company purchased a property at 120 Pitt St, on which they built a purpose built office, occupying it from 1886. Growth was hampered by the hard economic times of the late 1880’s and 1890’s and this lead to some shrinking of the Melbourne and Brisbane offices and the closure of the Adelaide office, but by 1894 the company boasted of being the largest insurer in Sydney. The company resumed growth with the new century and expanded offices in Melbourne in 1901 and Brisbane in 1912 and established a branch in Hobart in 1918 with an office in Launceston. The Brisbane office was initially at the corner of Queen and Eagle Sts and later at 377 Queen St, and 100 Edward St, but in 1926 the company purchased, and moved to, premises at 62 Eagle St. The Sydney office had been relocated to 16 Martin Place before a new head office was established in 1929 at 117 Pitt St. In 1938 they established a branch in Perth replacing their agency which had been established in 1920. Through the 1950s, 60s and 70s the company continued to grow with the acquisition of Oceanic Insurance, Australian General Insurance and Australian Metropolitan Life. In 1982 Mercantile Mutual became part of the ING Group when it acquired 50% of the company. In 1987 ING acquired 100% of Mercantile Mutual and the company changed its name to ING Australia in 2001. In 2002 ING Australia was partially acquired by the ANZ and in late 2009 ANZ acquired 100% of ING Australia. Device: Cancelling device from Brisbane only. 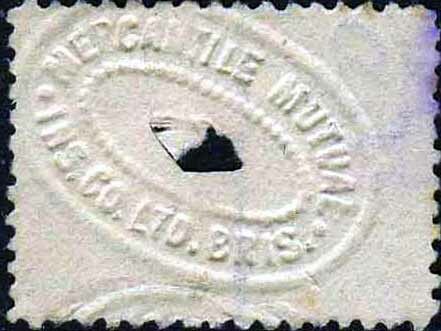 Two ring oval embossed with MERCANTILE MUTUAL at top and INS.CO.LTD.BRIS. at bottom separated by stops left & right with centre HORIZONTAL diamond shaped punch hole further tying the stamp to a document. 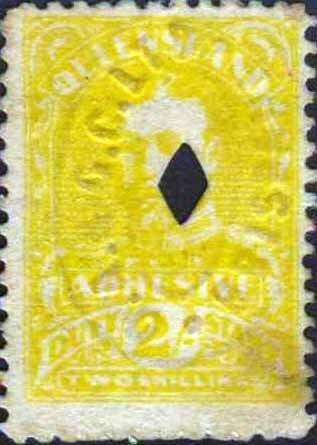 Revenue Use: KGV 1926 issue 2/-, 10/-. Rarity Scale: KGV 1926 issue 2/- R4, 10/- R4. Background: Ocean, Accident and Guarantee Corporation Limited was established in London, England in 1876 as an branch of the existing Ocean, Railway and General Accident Assurance Co. Ltd. The companies merged in 1890 under the Ocean Accident and Guarantee Corporation name. The company expanded into a broad range of emerging insurance products and created a series of subsidiary companies to match. The company not only expanded its product range but also its offices and by 1907 it had 32 offices across England and Ireland. International expansion occurred at the same time with offices opened in the USA, South Africa, New Zealand, Canada, China, France, Singapore, Korea, and Australia before 1912. The Australian office was established in Sydney in 1908. In 1910 the company became a subsidiary of the Commercial Union Assurance Company Ltd, but this did not slow international growth as they opened offices in Holland, Belgium, India, Batavia (now Indonesia), Malaysia, Kenya, Uganda, Egypt and Syria by 1936. In 1965 Ocean Accident's Irish business was transferred to Hibernian General Insurance Ltd and the company was absorbed and dissolved on December 23 2005 by the Aviva Group who are the UK’s largest Insurer. Device: Cancelling device from Brisbane only. Two ring oval embossed with O.A.& G.C. LTD at top and BRISBANE. at bottom separated by stops left & right with centre HORIZONTAL diamond shaped punch hole further tying the stamp to a document. 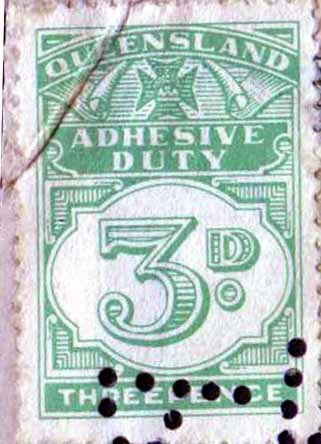 Revenue Use: KGV 1926 issue 8d, 2/-, 3/-, 5/-, 10/-. Rarity Scale: KGV 1926 issue 8d R4, 2/- R4, 3/- R4, 5/- R4, 10/- R4. Background: The Standard Insurance Company Limited was formed in Dunedin in 1874 as the Standard and Marine Insurance Company of New Zealand Limited Later in 1907 it was restructured as The Standard Insurance Coy of New Zealand (Fire, Marine & Accident). It traded in both Australia and New Zealand and in the 1930’s and 40’s it became increasingly involved in the provision of Third Party Motor insurance and Workers Compensation. The company had financial difficulties in the early 1960’s and it went into liquidation. Device: Cancelling device from Brisbane only. Two ring oval embossed with THE STANDARD INSURANCE at top and COY LTD. at bottom separated by stops left & right just below the centre, circular punch hole further tying the stamp to a document. 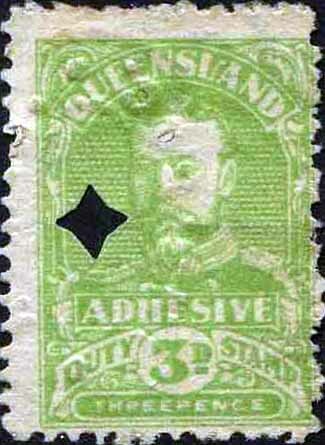 Revenue Use: KGV 1926 issue 1/-, 2/-. Rarity Scale: KGV 1926 issue 1/- R4, 2/- R4. Background: Western Assurance Co. Ltd. was known to have operated in Sydney between the late 1930’s and until the early 1960’s. It was absorbed in one of the many company take overs and amalgamations that were a feature of the Insurance industry in the 1960’s and 70’s. The Western Assurance name is now associated with the RSA Group (Royal Sun Alliance). Not to be confused with the “Western Australian Insurance Ltd”. This company was formed in Perth in 1912 as a fire and general company and expanded into the Eastern states of Australia, and to London in 1913. The Life Insurance department was not started until the end of 1918 and operated only from London and did not write Life Insurance business in Australia. After 1945 it was operating only from the United Kingdom and it was still trading in the late 1970’s. Another similarly named company the “Western Australian Insurance Co. (Canberra) Ltd” was floated by Manufacturers Mutual Insurance in 1959 with a view to purchasing the Australian business of the aforementioned “Western Australian Insurance Ltd” (1912). This company did not trade but secured the assurance that the 1912 entity would not do any more business in Australia. Device: Cancelling device from Brisbane only. Two ring oval embossed with WESTERN ASSUE. CO at top and INS. CO. LTD. BRIS. at bottom separated by stops left & right with centre HORIZONTAL diamond shaped punch hole further tying the stamp to a document. Revenue Use: Travelers Cheque - Numeral 3d. Rarity Scale: numeral 1936 issue 3d R2. 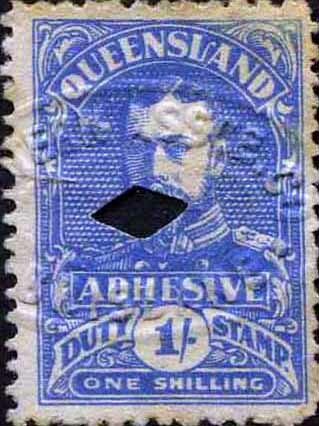 Background: Some confusion as to the identity of several part perfins from Qld on single washed off stamps. These have been identified as a 'PAID' cancel, partly cancelling the stamps as well as the travelers cheque. The PAID cancel was done at the time of cashing in the traveler's cheque.